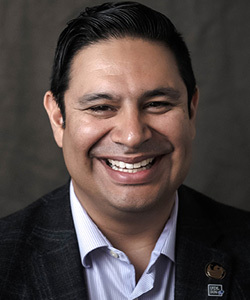 Eleazar Vasquez, Ph.D., BCBA-D, Director of the Toni Jennings Exceptional Education Institute and Associate Professor. His current research focuses on the evaluation of academic and behavioral outcomes for students with autism utilizing technology to enhance instruction. Dr. Vasquez was recipient of the inaugural Reach for the Stars Award (2014) and has been recognized as a Teaching Academy and iSTEM Fellow at the University of Central Florida. Recently his research has expanded from K-12 schools to postsecondary institutions and other venues to prepare students who are traditionally marginalized, such as those with executive functioning disorder, for careers in STEM related fields. Dr. Vasquez’s research has been supported in part by $8 million from the National Science Foundation and Department of Education, Office of Special Education Programs. Nationally Dr. Vasquez serves as the Treasurer for the Universal Design for Learning Implementation and Research Network, and Technology Chair for the American Council for Rural Special Education. Taylor, M., Vasquez, E., Donehower, C. (2017). Computer programming with early elementary students with down syndrome. Journal of Special Education Technology. Vasquez, E., Marino, M. T., Donehower, C., Koch, A. (2017) Trial-Based Functional Analysis in Virtual Environments. Rural Special Education Quarterly (invited special issue). *+Pearl, C. E., Vasquez, E., Marino, M. T., Rosenberg, M. Wienke, W. Donehower, C., Gourwitz, J. & Duerr, S. (2017). Establishing content validity of the Quality Indicators for Classrooms Serving Students with Autism Spectrum Disorder instrument. Teacher Education and Special Education. DOI: 10.1177/08884064166814. Rock, M., L., Spooner, F., Nagro, S., Vasquez, E., Dunn, C., Leko, M., Luckner, J., *Donehower, C., *Jones, J. L. (2016). Transforming teacher development in the digital age: Policy drivers, implications, and recommendations. Teacher Education and Special Education (Invited Special Issue) 39 (2): 98-120. Vasquez, E., Welch, G., Marino, M , Hughes, D., *Koch, A., *Delisio, L., (2015). Virtual learning environments for students with disabilities: A review and analysis of the empirical literature and two case studies. Rural Special Education Quarterly (Invited Special Issue) 34(3):26-32.